Chrome Task Manager to kill open tabs at once easily:- If you are like me, while browsing you will have 100 tabs open at a single point in time. Even though this can be quite helpful, do you have any idea about the impact this can cause to your browsing experience? If you have many a number of tabs open at the same time, your browsing speed can significantly go down. It can affect your battery’s life as well as your laptop’s performance. The ready made solution is to close the tabs. But that doesn’t just seem right, does it? You might need to get back to those tabs soon and closing them might cost you some valuable information. So what’s the solution? 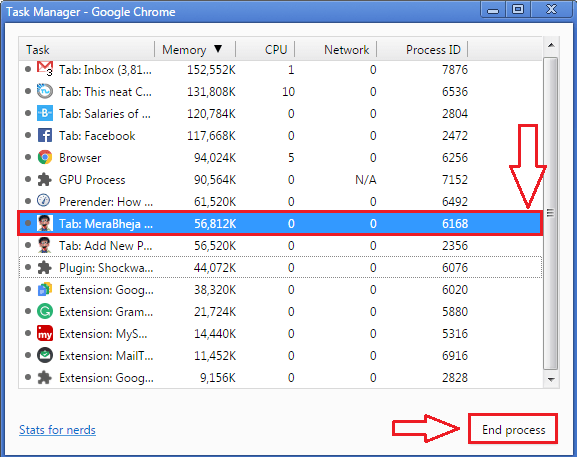 You can stop a tab from taking up your memory by stopping that tab in your Chrome Task Manager. The tab will still be open, but it won’t take up any space. How does it sound? If your answer is awesome, read on! 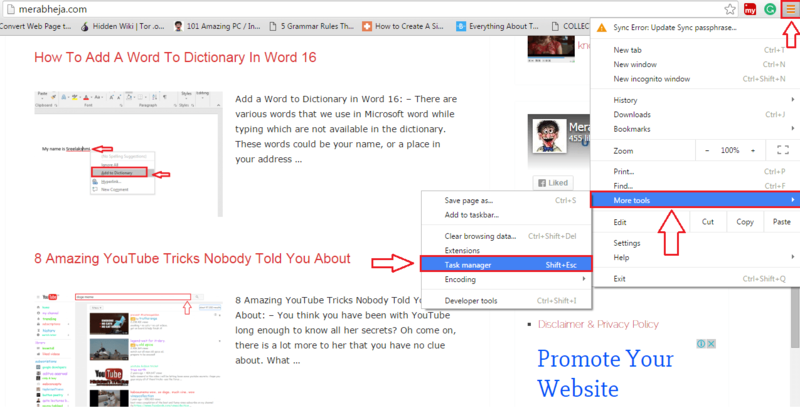 Click on the More Actions icon at the top right corner of your Chrome page. From the menu that gets expanded out, click on More tools and then on Task manager. 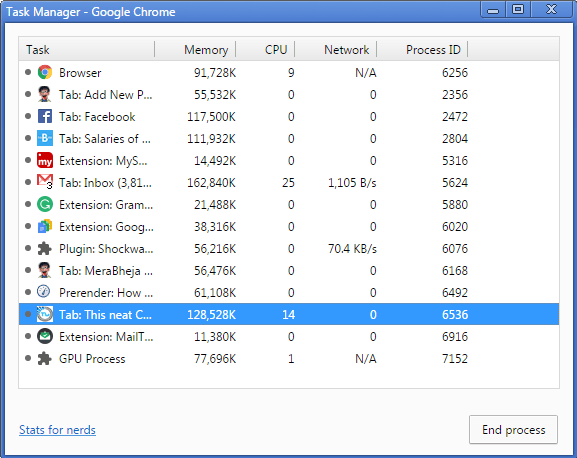 This will open the Google Chrome Task Manager as shown in the following screenshot. 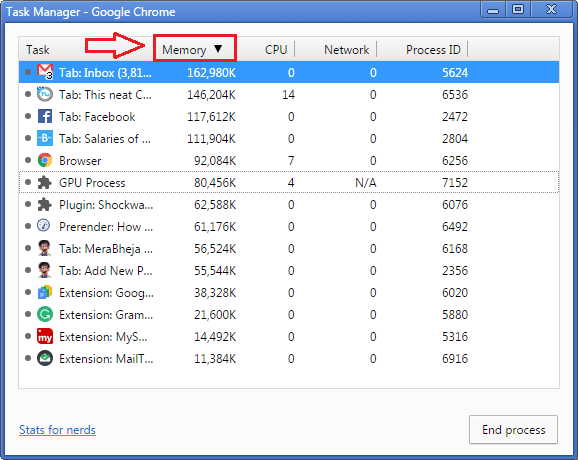 Now if you click on the Memory tab at the top, you will be able to see the Google Chrome tabs that are currently running based on their memory usage, which can be used to determine which all tabs needs to be closed for better performance. You can select a tab by clicking on it. 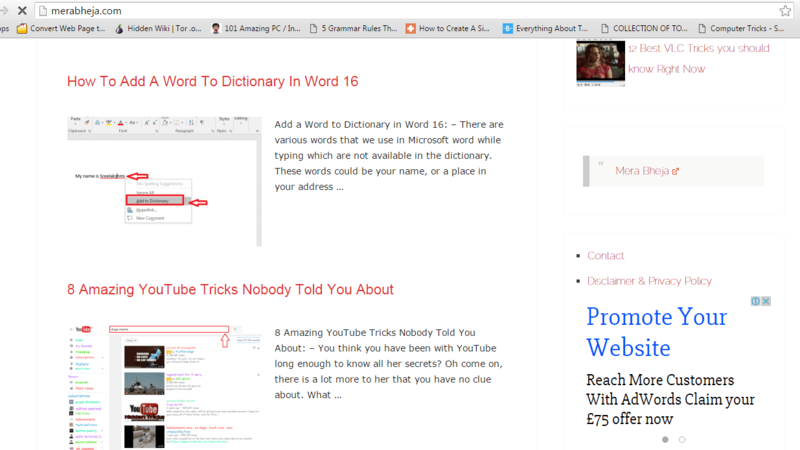 Once you have selected a tab, simply click on the End process button as shown in the screenshot below. Now if you open that particular tab, you will be greeted with the Aw, Snap! Something went wrong while displaying this webpage error message. Don’t worry, you can always click on the Refresh button at the top to get back to your page. Once you click on the Refresh button, your web page will come back to life, like the long-lived Pheonix. Now you can browse with your Google Chrome with even a 100 tabs open and not compromise the memory performance even by a bit. Hope you found the article useful.